DCM will be serving our Thanksgiving Day Celebration from 2:00 pm to 3:00 pm at St. Martin’s Episcopal Church, 640 Hawthorn Lane. This will be our 12th Annual Celebration of the Holiday. Jeff Murphy, formerly of Seasons Restaurant in Davis and Bistro Sabor in Napa, will be our guest chef. He has been cooking for us on Thanksgiving for many years. I can’t say enough of the help and dedication of our volunteers for Thanksgiving. Several families, student groups and individuals have volunteered for us continually for the past several years. They are an inspiration. All are welcome to attend. We generally serve up to 120 individuals each year. The menu for 2015: turkey, stuffing, homemade cranberry sauce, mashed potatoes, Jeff’s fabulous gravy, vegetables, blueberry crisp, pie, drinks, coffee and more. A Taste of India Dinner a Great Success! Davis Community Meals would like to sincerely thank all who attended and supported our Taste of India Dinner on Saturday, November 7th. The event was a great success due to your support. The event was festive and enjoyed by all who came. A special thanks to our cook for the event, Mary Philip, and to her cooking crew. Mary and her husband, Philip, graciously donated the food, their time and cooking expertise to a memorable meal that was enjoyed by all. Thank you to St. Martin’s Episcopal Church for sponsoring the event and for the use of their hall and kitchen facilities. Thanks to the UC Davis Circle K Club for their volunteer help! Davis Community Meals’ mission is to provide low-income and homeless individuals and families with housing, food, and human services to help them rebuild their lives. Through your support, we are able to meet a critical need for food and shelter in the Davis community. Davis Community Meals will be hosting A Taste of India Dinner on Saturday, November 7, 2015 at 6:00 pm. The event will take place at St. Martin’s Episcopal Church, 640 Hawthorn Lane, in Davis. Local Chef, Mary Philip, will be preparing a festive gourmet Indian dinner for guests to enjoy. Tickets for the dinner are $35 per person. To obtain tickets, people are invited to call the Davis Community Meals administrative office at 530-756-4008 or by email: billpride-dcm@sbcglobal.net. Tickets are also available at the Davis Community Meals administrative office, 202 F Street, in downtown Davis. Proceeds from the dinner will support Davis Community Meals programs and services to community members in need and who are homeless or at risk of homelessness. Davis Community Meals is a non-profit, non-denominational organization whose mission is to provide low-income and homeless individuals and families with housing, food, and human services to help them rebuild their lives. Davis Community Meals operates several programs, including free meals, emergency shelter, transitional housing, outreach, permanent supportive housing, and a resource center and day shelter. Davis Cook’s Showcase a Great Success!! 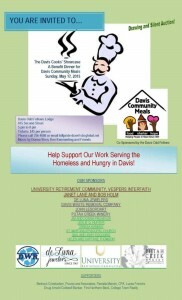 Davis Community Meals would like to sincerely thank all who attended and supported our Davis Cook’s Showcase on Sunday May 17th. The event was a great success due to your support. The event was festive and enjoyed by all who came. Thank you to the Davis Odd Fellows and Dody Black for sponsoring the event and for the use of their lodge and kitchen facilities. A special thanks to our cooks for the event, Tamas Torok of Seasons Restaurant and Jeff Murphy. They graciously donated the food, their time and cooking expertise to a memorable meal that was enjoyed by all. Big thanks to our sponsors of the event and their continuing support: University Retirement Community/Vespers Interfaith Committee, Janet Lane and Bob Holm, De Luna Jewelers, Davis Waste Removal Company, John Lescroart, Putah Creek Winery, Jim and Donna Provenza, Leslie Q. Hunter, Teresa Kaneko, Sheryl Cambron, Marilyn Moyle, St. Martins Episcopal Church, Gail and John Cooluris, Helen and Captane Thomson, and the Mexican American Concilio of Yolo County. For their generosity, thanks to our supporters: Bedrock Construction, Purves and Associates, Pamela Mainini, CPA, Lucas Frerichs, Doug Arnold Coldwell Banker, First Northern Bank, College Town Realty, Pacific Auction Company, Jennifer Maloney of Livable Design and Events, Dr. Howard Schempp, Walt and Barbara Sherwood, Sandy and Jeff Granett, and Alison Pease. Thanks to Whitehall Lane Winery and Putah Creek Winery for their donation of wine and thanks to Donna Wren and Ken Kemmerling for the great music. 2015 Davis Cooks Showcase, Sunday May 17th, 5:00 pm. Tickets for this event are $45.00 per person. Tickets include dinner, and wine and refreshments. Proceeds from this event will support the programs of Davis Community Meals including the Resource Center and Shelter, Transitional Housing, and weekly free meals.